The Lightstreamer Blog: Lightstreamer 6.0 Is Out! Installing Lightstreamer 6.0 is as easy as pie. When done, a brand new welcome page will let you know that the installation was successful. Some neat live demos will start running. Enjoy the demos by opening multiple browser windows, so that you can interact and see all the data fully synced in real time. Lightstreamer comes with a lot of source code examples, which cover the many flavors of the client-side and server-side supported platforms and languages. A browsable database of all the available examples has been made available online. Go to demos.lightstreamer.com and filter your search by product, component, application category, and platform. For each result, you will get a link to a project hosted on GitHub and, in many cases, a link to a live demo. The documentation of Lightstreamer has been revised and improved. In particular, you might want to check out the new version of the General Concepts document, with describes the Lightstreamer architecture and principles. Lightstreamer 6.0 introduced support for native push notifications for Android (Google GCM) and iOS (Apple APNs). Push notifications are the best way to send live data to a mobile app when the app is not running. When the app is active, the typical Lightstreamer's streaming (based on Web protocols) take place, with high throughput, low latency, and low bandwidth. But when the app is not active, push notifications still allow you to send data to the app. With Lightstreamer 6.0, it is now extremely easy to leverage both the streaming channel and the push notification channel. Ready-made integration with Google GCM and Apple APNs services is provided. Your Lightstreamer Data Adapter don't need to do anything new. But your clients will be able to subscribe to items via push notifications too. In other words, you can now exploit the full power of mobile push notifications with no additional server-side coding! And you have the added benefit of using a single engine for all your real-time traffic, routed over Web protocols and push notification protocols. The MPN module is optional for all the editions of Lightstreamer. You can play with it with your Demo or Eval license. To purchase it for production, please contact info@lightstreamer.com. 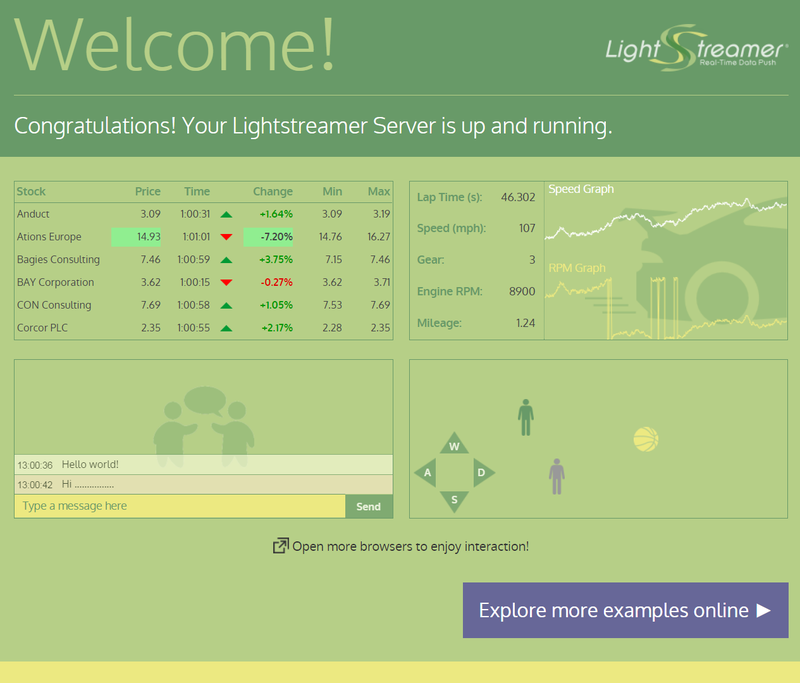 The first tab shows a visual representation of the Lightstreamer architecture, with several overlays containing the metrics (connections, sessions, throughput, memory, thread pools, etc.). The second tab displays real-time graphs of the main metrics. The third tab contains the logs. The fourth tab hosts the "JMX Tree", where the monitoring objects can be browsed and inspected. The Monitoring Dashboard is a convenient means of watching the server for both developers and systems administrators. By default, it is available at the "/dashboard/" URI of your Lightstreamer Server. Make sure you check it out! Before Lightstreamer 6.0, all the Java Adapters had to run in-process with the Lightstreamer Server. Only .NET, Node.js, and generic Adapters could run out of process. With Lightstreamer 6.0, Java Adapters can run out of process too and they can even be deployed on different machines. A new SDK has been included in the Lightstreamer distribution ("sdk_adapter_java_remote") with all the resources need to develop remote Java Adapters. The Lightstreamer Server now uses separate ClassLoaders for the server itself and for the adapters, preventing the rise of any conflicts. Furthermore, every Adapter or Adapter Set can use a dedicated classloader, achieving a complete isolation. ClassLoader configuration is flexible and very fine grained, with support for any requirement. The Lightstreamer Server is now fully compatible with the PROXY Protocol, which allows a reverse proxy or a load balancer to provide the server with connection information, such as a client's address. This means that even with network intermediaries that work at TCP level (if they support the PROXY Protocol), the Lightstreamer Server is able to get the IP address of the originating client. Previously, Data Adapters didn't have a way to clear the contents of the current snapshot for an item, until all the clients unsubscribed from that item. Lightstreamer 6.0 provides methods for explicitly clearing a snapshot at any time. Check out the new clearSnapshot and smartClearSnapshot operations on the Server's ItemEventListener interface. The Adapter Remoting Infrastructure (ARI) adapters are now pre-deployed and embedded in the server. This makes much easier to attach remote adapters (Java, .NET, Node.js, or generic) to the Lightstreamer Server. The ARI itself has undergone several improvements. The iOS and OS X client libraries have been extended to support NSError as an alternative to exceptions. Developers can now choose whether to leverage exceptions or conform to a more Apple-standard approach, where NSError is used for most cases. 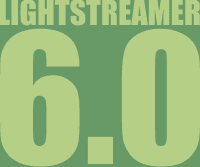 Lightstreamer 6.0 contains many many more improvements and fixes! See the full changelog to know all the details. You can download Lightstreamer 6.0 from download.lightstreamer.com. Lightstreamer Allegro, Presto, and Vivace editions contain a Demo license, which allows you to serve a maximum of 20 concurrent users. If you have a valid maintenance contract in place, please contact support@lightstreamer.com to get your new Production and Dev/Test license keys for free.